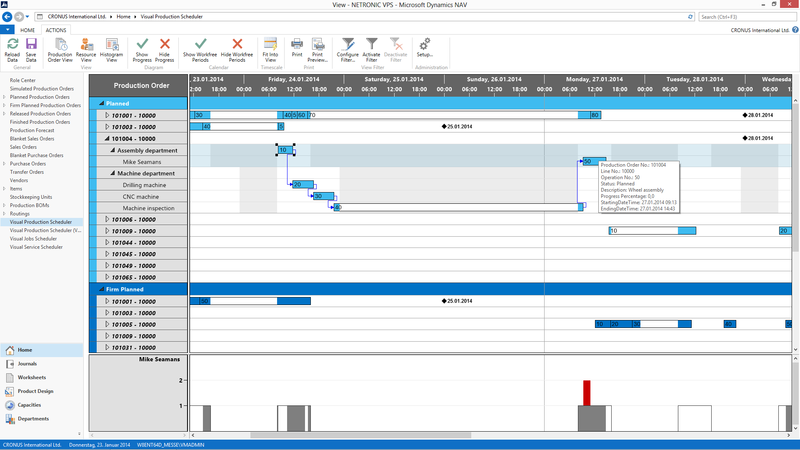 What Is Visual Scheduling For Microsoft Dynamics NAV? When attending NAV Directions in both San Diego and Poznan, we discussed our idea of a visual schedule with many attendees: ISVs as well as resellers as well as Microsoft staff. From all these discussions we won the impression that there seems a general interest in digesting our thoughts and considerations about (a) the concept and (b) the way of how we decided to add visual planning capabilities as fully-integrated, repeatable add-ins to Microsoft Dynamics NAV. Hence, we decided to summarize these thoughts in a complementary Ebook and to discuss selected content from this Ebook in a series of blog posts, of which this is the first one. Interestingly enough, when you look up “visual scheduling” in a search engine, you find two types of sites: One with a medical/ educational flavor and the other with a more business/ enterprise related flavor. Although the focus of this Ebook is on the enterprise perspective, it seems to be worthwhile broadening the perspective for the purpose of this introduction. It utilizes the children’s visual strengths and hence provides a receptive communication system to increase understanding. It supports learning new things as children get used to mastering tasks that they perceived as unexpected. It increases the individual’s flexibility. I guess you already sensed it: There are some obvious parallels between using a visual schedule to help and guide children with ASD and using a visual schedule in a business context. Nevertheless, I want to shed some light on what visual scheduling means for an enterprise. Let’s start with the difference between planning and scheduling. To me planning (e.g. of production orders, projects or service tasks) is about working out what to make, when to make it and in some applications where to make it. It works with sales orders or projects, forecast demand as well as item, stock and other data. It works in 'buckets' or 'periods' of time, maybe by day, maybe by week, maybe by month or more probably a combination of all of these depending on how far the plan is projected into the future. Say the next 2 weeks by day, next 2 months by week and next 12 months by month. In turn, scheduling is about the execution of a plan – the sequence in which operations or tasks are to be carried out on what resource(s) at what time and it takes into account more complex constraints that matches the real constraints. It is also more interactive. When resource availability changes, materials availability changes, when demand changes an interactive schedule allows generating 'what if' alternatives before the decision is made to change the schedule and consequently execution. So you are managing individual orders or tasks and individual resources in close to real time. Both – planning and scheduling – have a role to play. In fact, you may want to integrate the two. A planning tool should feed the scheduling tool which in turn feeds back to the planning tool. However, here I solely focus on scheduling in the discussed meaning of executing a plan in the shorter term. Now that scheduling is defined, I can spend some more thoughts on visual scheduling and will do this by again looking at different terms – in this case the difference between an advanced and a visual schedule. Advanced scheduling (and planning) typically refers to the manufacturing industry and describes the art of allocating raw materials and production capacity in an optimal way to meet the demand. Advanced scheduling typically uses finite capacity scheduling that assumes a fixed capacity for resources and will not load more than that resource’s capacity. Hence, the schedule is generated by applying techniques for solving combinatorial optimization problems such as linear programming, advanced mathematical formulas, and heuristics to create the best (possible) schedule for the manufacturing processes. These algorithms have the ability to simultaneously take into account capacity and material constraints (and often also competing priorities) when generating the production schedule. In contrast, a visual schedule is not necessarily limited to the manufacturing industry. It always requires the existence of an underlying ERP system (or similar) that generates a task- and time-oriented plan (like a production plan, a project plan, a service jobs plan, etc.) in the above sense. A visual schedule then represents this plan in an intuitive visual manner (even it is not optimized), highlights dependencies and conflicts and lets the user manually develop and change the (short-term) schedule based on the information provided. Other than advanced scheduling, a visual scheduledoes not necessarily need an underlying model (e.g. of the shop floor) to produce the best plan and hence does not struggle with always needing to update the model to the changing reality. Hence, visual scheduling is a methodology in which changes to a schedule are implemented by manually changing elements of the schedule’s visualization. Visually scheduling applies the art of data-driven visualization so that it helps users to focus on the decision-relevant information. The below screenshot gives an example of a visual schedule. Provides a comprehensive overview of a time-related, resource-oriented schedule with dependencies. Highlights conflicts and keeps the user focused on the decision-relevant data. Enables corrective actions in terms of drag & drop changes to the schedule. Keeps the user (and not the system) in the driver seat. 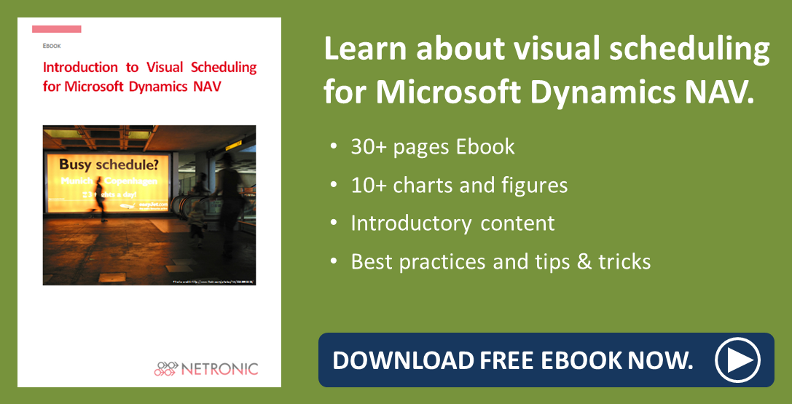 Want to learn more about visual scheduling for Microsoft Dynamics NAV? Get your free Ebook!